After years of facilitating workshops and presenting keynote addresses for employees at high-performing companies, I’ve learned that in successful companies, employees aren’t overly competitive or stressed. In fact, what makes those companies successful is that their employees are actually happy and excited about going to work. Why Focus On Building Positive Workplaces? Studies show that there’s a correlation between employee satisfaction and a company’s success. 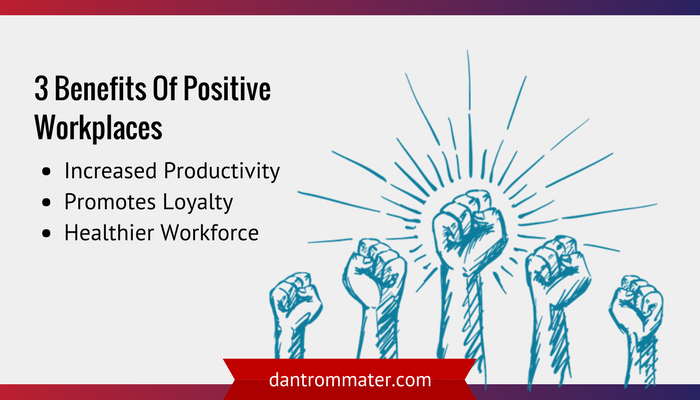 In fact, these studies show that positive workplaces impact things like productivity and loyalty. This has a direct effect on the bottom line. That’s why there’s no surprise that giants like Facebook and Google have the highest employee satisfaction rates in the US. According to a recent study conducted by a group of economists at the University of Warwick in the UK, happy employees are better employees. The study actually found that happiness can lead to a 12% growth in productivity. Every year, Fortune magazine puts together a list of the 100 Best Companies to Work For in the US. Most of these companies have at least one thing in common: their employee turnover is lower than average. Replacing employees costs a lot of money. According to a study by the Center for American Progress, to hire and train a new employee, companies usually dishes out an extra 20% of that employee’s salary. By reducing workplace stress, you can reduce voluntary turnover by nearly 50%. This will help cut costs and allow you to retain top talent. High-pressure companies spend millions of dollars every year to deal with stress. These costs go into healthcare and workers comp. In fact, studies show that stress is responsible for up to 80% of workplace accidents, and 80% of doctor visits. But high-stress levels don’t only lead to elevated healthcare costs. They’re also linked to things like mental health problems and cardiovascular disease. This alone is a good reason to invest in making a more positive work space. By now you probably get the point: reducing stress and creating more positive workplaces is important on both a human and a financial level. But how do you go about getting that done? Here are five things you can do right now to create a positive workplace. Show that you’re happy: Happiness is contagious. It should start with you. Promote volunteering: Helping others out makes employees happier. Provide time for physical activity: Exercise helps sharpen the body and the mind. Don’t micromanage: Show your employees that you trust them. I’m a huge promoter of the virtues of empathy. Putting yourself in your employees’ or colleagues’ shoes will give you insight into their lives and their daily tasks. This, in turn, will allow you to better understand who they are and what they do. This will help build stronger personal and professional bonds, which improves morale. The happier and more comfortable people are at work, the harder they’ll work. Everybody likes it when their hard work is recognized. Don’t wait for end of year reports to thank your employees and colleagues for their good work. Make it a habit to thank people often and in different ways: face-to-face, in writing, at the end of your emails. Feeling appreciated, many experts say, is usually the first step to being truly satisfied on the job. All successful companies are built on innovation and creativity. But many companies don’t give their employees enough freedom to explore this all-too-important facet of their lives. This has a negative impact on employee satisfaction and, in the long-run, on the bottom line. In this regard, Google is a model to follow. As part of the company’s policy, employees are given time to explore passion projects during work hours. Most of the time, these projects don’t lead to anything. But once in awhile, these experimentations lead to projects like Google Maps and Gmail. You may not be trying to create the new Gmail, but you can encourage your employees and colleagues to share their thoughts and tackle problems in creative ways. This will make everyone feel valued, increasing employee satisfaction and potentially leading to new innovations. Mentorship programs are a great way to build a positive workplace and increase employee satisfaction. When an employee is mentored, he or she feels supported and invested in. This improves loyalty to the company while also helping them improve their technical skills. If you’re a manager, invest time in mentorship and you’ll quickly see its impacts on your employees and on your bottom line. 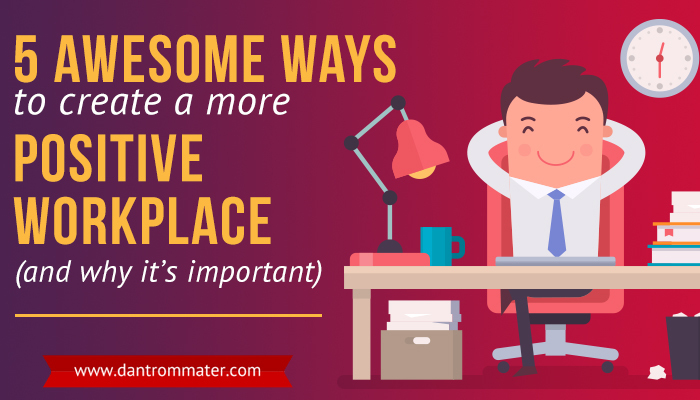 A more positive work atmosphere will change the way your team perceives work. The impact is not only a better place for people to spend their days but also has a waterfall effect into other areas of life. Make sure you check out 5 Powerful Positive Psychology Hacks To Transform Your Team for some great techniques that you can use to improve your skills.